O Senor Santo Nino, you are our king and our God, we worship you. You are our strong defender, we turn to you. You are the patron of Cebu, the Philippines and the world, we come to you; You have made extraordinary wonders through your miraculous image in those chosen islands, remember us. Look down at this poor soul that comes to you for help. Lead us with Your wisdom; discipline us with your truth; console us with your tenderness, protect us with your might. We consecrate today our thoughts of you, only with you shall they be occupied; our words, only of you shall they speak; our sufferings, that we may endure them for your sake. We beg you Senor Santo Nino, illumine our understanding, kindle our will, cleanse our body, sanctify our soul. We wish what you wish, because you wish, as you wish, as long as you wish. Grant us, Senor Santo Nino that we may feel love toward you, be strict toward ourselves be zealous toward our fellowmen, and rightly despise the things of the world. Help us to overcome sensuality with strict discipline, avariciousness with generosity, anger with gentleness, indolence with zealous industry. Make us wise in counsel, courageous in danger, patient in adversity, humble in prosperity. O Santo Nino, who has said, "ask and you shall receive; seek and you shall find; knock and it shall be opened unto you," Give we beseech you, to us who ask the gift of your divine love, that we may love you with our whole heart, in word and work, and never cease from showing forth your praise. 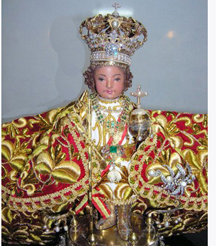 Senor Santo Nino, with your scepter guide our people, Who hail you king forever; the World is your Kingdom. Senor Santo Nino, in Your hands the world find its resting; Proclaim your truth and justice, bring to us Your peace and love. we beseech you to cast a merciful look on our troubled hearts. Let Your tender love, so inclined to pity, be softened at our prayers, and grant us that grace for which we ardently implore you. Take from us all unbearable affliction and despair. For your sacred infancy's sake hear our prayers and send us consolation and aid that we may praise you, with the Father and the Holy Spirit, forever and ever. Amen.